This is just a minor question to speed things up a little bit, but I'm wondering if I can reference other colours and add additional information in my XML file. I know that looks horrible and doesn't work, but hopefully it makes it clear what I'm looking to do. Obviously the time saving on this isn't significant so an awkward workaround isn't going to help much but it seems like a possibly existing feature/hack I can't find. You can adjust alpha value to increase or decrease the amount of transparency. I guess what you're trying to accomplish (applying alpha filters to defined colors) can only be done in the java part. Yes of course you can add transparency level with color code. Please try with below color code. I have added 1A before your color code which set 10% transparency level. Same way you can add all the code which i have listed below. Not the answer you're looking for? 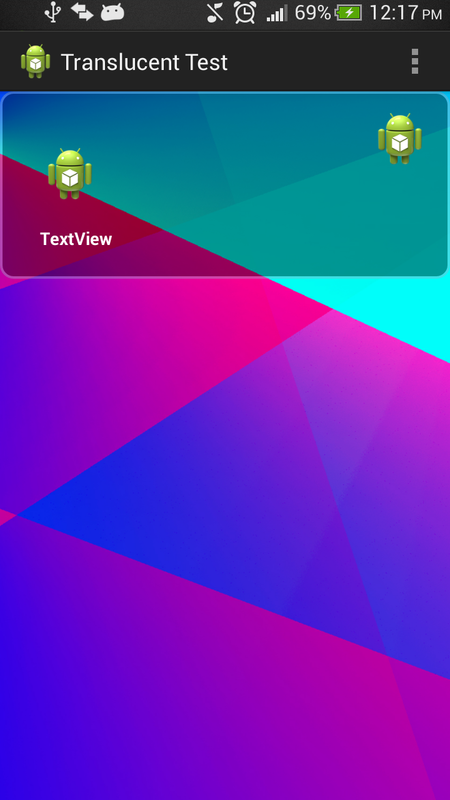 Browse other questions tagged android xml colors or ask your own question.